This is the deal I picked up yesterday and called to book my time. If you have never used a WagJag coupon like me then here is how you go about this great offer. I called to ask the lady a few questions about the deal and the cabins. I did ask for the availability I would like as this is only offered in from May 27th - June 30/11 and I only have a week off in June. I wanted to make sure I could get in on my week vacation. Bonus, there was a cabin available. The lady held it for an hour for me to go purchase the deal and call back with the Voucher number. Which I did all in 15 minutes! 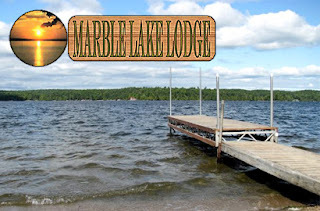 My family will be heading to Marble Lake Lodge in June for a two night stay. The cabin we have booked is a two bedroom, with full kitchen, tv/dvd and shower. They do ask you to bring your own bedding and towel but that isn't a big deal to me. I actually prefer that. The lady who I booked with was very nice and friendly and I am excited for our visit. Vacation - What is a vacation? I agree with you. My family also could use one of those great opportunities. A chance to get away, relax, and renew our time together. Marble Lake Lodge sounds perfect. I'd love to go on a vacation this year! My sister is due to have a baby towards the end of June, so we'll see. He is a Trisomy 18 baby. She's due to have him on my birthday, but will probably go early. I really wish I could see into the future to know what is going to happen.